This 1989 12 Meter Trojan International is Meticulously Maintained with Significant Upgrades. 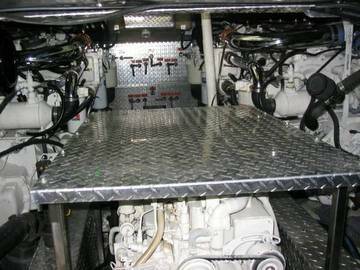 Featured are twin 485hp Detroit JT671 Turbo Charged Intercooled Diesel Engines with only 1602 hours. 8 KW Onan generator, 3000 watt power inverter, Furuno Radar, Robertson Auto Pilot, Glendenning Engine Syncronizers, Garmin GPS, Gaffrig Bezel Gauges, full Marine Helm Instrumentation, and Rockford Phosgate Sound System. Twin 485 hp Detroit Diesel JT671 Turbo Charged Intercooled Engines equipped with Walker Air Separators, only 1602 hours. Twin Disc M6507A Transmissions. Prop Shafts are 1 ¾” Stainless Steel with Vibration Isolaters. Props are Bronze Quads 24” diameter by 26 pitch. Twin sets of Trim Tabs. The engine room is lighted with Checker Plate and Mirrors. Also, permanent Block Heaters. There is a 110 volt Positive Displacement Gear Driven Oil Change System for Oil Removal and Oil Replacement for both engines and Generator. The air compressor is a 110 volt/135 psi system for Triple Trumpet Horns with Transom and Engine Room Attachments. New in 04; New Fuel Injectors and Cutlass Bearings. New in 03; New Fuel Manifolds, New Exhaust Hoses, New bottom Paint. This Vessel is Professionally Maintained. 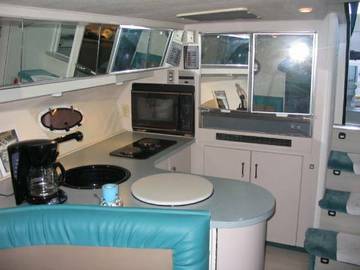 The galley is spacious and very modern immediately starboard upon entering cabin. Featured are side by side Sub Zero Refrigerator/Freezers, a General Electric Microwave/Convection oven, a Raised Plate Kenyon 2 Burner Electric Stove, a black Porcelain Sink with pull out Faucet, separate Dish Drainer. There is ample Galley Storage with (4) Drawers and (2) Cabinets below the formica countertop. 8 KW Onan Diesel Generator. 3000 watt Coleman Powermate Power Inverter. Dual 30 amp/120 volt Shore power with cords. The (5) battery system includes; (3) 4D Deep Cycle batteries for the inverter and stereo system, (1) 8D starting battery, and (1) group 31 battery for the Onan Generator. The battery charger is a Guest 30 amp Triple Bank system. Additional 120 volt outlets have been added, (2) in the Cockpit, (3) in the Engine Room, as well as the Main Salon. Automatic Windless with Aluminum Fortress Anchor. The windless has 150 ft. of chain rode and 150 ft. of ¾” line. Enclosed Fender Storage Compartments on the port and starboard bow. 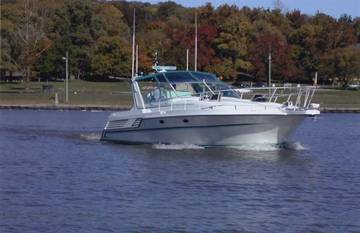 The transom and swim platform include; Oil Drain System portside with Fresh Water Washdown and Dockside Water Hookup starboard. There is a Hot/Cold Transom Shower as well as Air Compressor Hookup for inflatables. 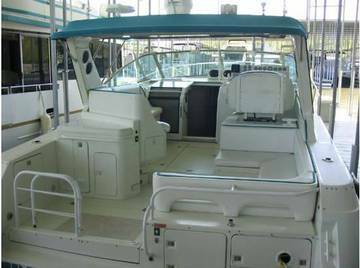 (2) additional storage compartments with Gas Assist Doors at starboard transom. Bimini Top with full Eisenglass/Screened enclosures side and rear curtains. Additional Slanting Aft. Camper Curtain. The aft cockpit lounge features a Hi/Lo Cocktail Table and Filler Cushions for Full Sun Lounge on the starboard side. To portside is a Wet Bar with automatic liquor dispensing for (5) bottles, liquor storage, and U Line Ice Maker. All cockpit upholstery is new in 2004. All cabin salon upholstery and carpeting was new in 2003. The cabin will sleep 6 and is very open, spacious and stylish. 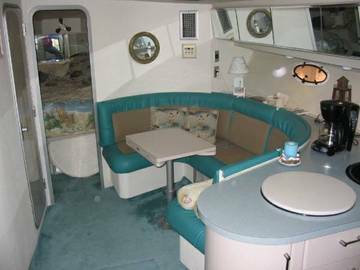 Upon entering the cabin and immediately portside is a lounge/settee that is convertible to quarters. This area features a 20” Citizen TV/VHS/VCR as part of the entertainment system. Portside is the Head with separate shower and dual entry. Head has a Vacu-flush lavatory, sink, vanity, and mirror. The master stateroom is forward and features a Queen Sized Island Bed with generous storage. There are (2) hanging lockers and (6) mirrored overhead wing storage lockers. From the master stateroom to the starboard is the dining area with lounge and settee that is convertible as well. Cabin comfort is provided by a 16,000 BTU ac/heating system with Digital Climate Control. The galley is immediately starboard upon entrance to the cabin. A new 20 gal. Water heater with piped in bypass was added in 2004. There is ample storage in the salon with 4 upper cabinets and 2 wing door cabinets. The electrical panel is located under the Sub-Zero refrigerators. Helm instrumentation includes (2) Icom M402 Ship/Shore Radios with (2) remotes. One each located by the Port lounge and at the Transom. Twin 9 ½ foot VHF antennas. The radar arch includes a TV antenna and a cellular telephone antenna. 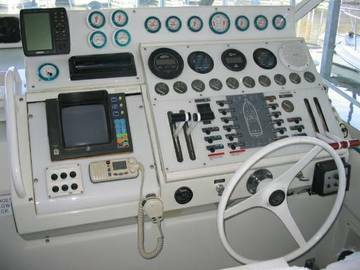 Navigation equipment includes a Garmin Model 185 GPS Map Sounder and Furuno Radar. There is a Robertson autopilot, a Gaffrig Digital GPS/MPH, and a standard Horizon Depthfinder to 999 feet. Glenenning Engine Syncronizer and Power Captains Chair for comfortable cruising. Instrumentation gauges include: Dual Raw Water Pressure, Fuel Pressure, Turbo Boost, Engine oil Temperature, Transmission Oil Temperature, single face Dual Pyrometer, Digital FloScan Gauge to include hours, GPH/MPG, and dual RPM’s. Rudder Angle Gauge, Fireboy 1301 Halon System indicator, and a Clock. There is a remote Spotlight by ACR Electronics and an Automatic Windless with Fortress Anchor. Switches include: Stop, Start, Ignition, Emergency Power, Back up lights, Arch Lights, Courtesy Lights, Panel Lights, Nav Lights, Blower, Dual Windshield Wipers, and Horn. All Gauges are Gaffrig Raised Bezeled.